The United States steel industry faces severe headwinds as steel prices continue to fall. Even as recently imposed protectionist measures on certain imported steel products take effect, tariffs alone may be insufficient in helping steel producers recover their lost momentum. To survive in today's environment, US steel producers must manage their debt burdens, improve top- and bottom-line growth, and defend their positions through business transformations and restructuring. While these measures provide some support by maintaining price levels in the short-term, they fail to resolve the broader challenge in the global market: removing excess capacity. Additionally, the recent tariffs neither generate new market demand for US steel products nor extend a lifeline to overleveraged companies already dealing with rising financial strains (see figure 1). These factors and many others are placing increasing pressure on the industry as debt loads reach unmanageable levels and global expectations for growth in China remain underwhelming. To meet these hurdles, fundamental operational and balance sheet changes will likely be required to help steel producers maintain market share and remain competitive. Slowing end markets—Scaled back real estate and infrastructure projects in China – which accounted for more than half of global steel production in 2015 – have reduced its need for steel inputs and other commodities. Steelmakers with high exposure to the resources and infrastructure sectors have been hard hit, with demand for steel, particularly material for energy and mining projects, trending down as plummeting commodity markets deter capital expenditures. Overcapacity—An estimated 400Mt per annum of global overcapacity continues to weigh on the steel industry following years of demand growth from the China supercycle. High fixed costs mean failure to fully utilize existing capacity is translating into lower efficiency, disproportionate operating costs, and diminished pricing power. Dumping excess offshore—In an attempt to curtail losses from declining domestic steel demand, Chinese manufacturers are offloading excess supply into offshore markets at steep discounts, gaining market share, undercutting local producers, and driving down prices in these markets. Recently imposed US trade barriers may have limited long-term effect because they are country-specific and new importers tend to emerge when the old ones are kept out. While US steel producers benefit from geographic advantages and existing relationships with domestic industries in the downstream, fundamentals within the local market continue to weaken the domestic industry. Cheap scrap has given so-called mini-mills that melt scrap in electric arc furnaces the cost edge over integrated producers, which utilize resource intensive blast furnaces. Under siege from imports and mini-mills, integrated steelmakers are retreating into defensible markets with very high specs, such as automotive high strength steel and high quality products used in the petroleum sector. However, even these markets are showing signs of weakness – petroleum due to declining oil prices and automotive due to slowing sales, aluminium substitution and the gradual shift of manufacturing to Mexico. Making matters worse, much of the industry is cash-flow negative at current steel prices, in some cases even before debt servicing costs. To survive in today's environment, US steel producers must manage their debt burdens, improve top- and bottom-line growth, and defend their positions through business transformations and restructuring. 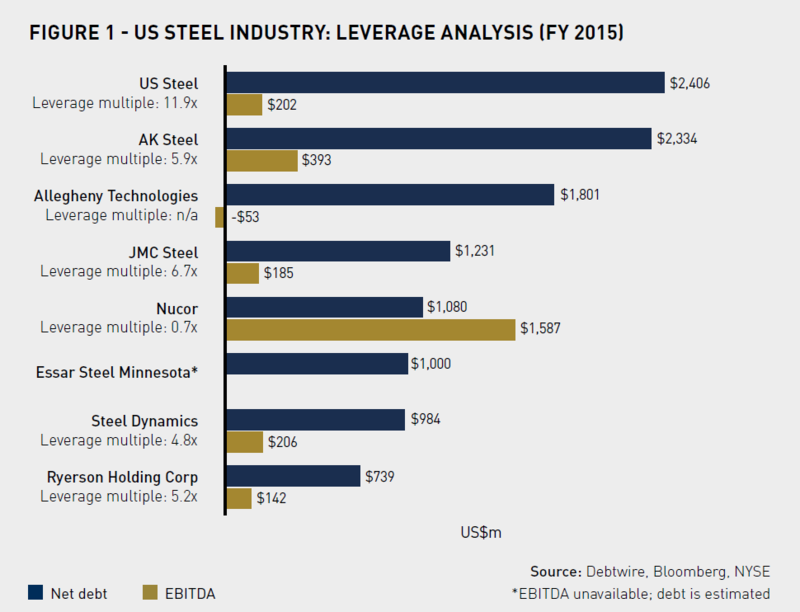 Many US steelmakers are entering dangerous waters as their debt reaches unsustainable levels and as liquidity dwindles. The following is an analysis of credit metrics among stressed and distressed steelmakers from fixed income intelligence provider Debtwire. Despite a boost to its market performance following the announcement of countervailing measures, US Steel's ailing financial condition continues to be an impediment to growth. This, matched with declining year-on-year revenues — from US$17.5bn in 2014 to US$11.5bn in 2015 — has brought into question the steelmaker's ability to pay off bonds maturing in 2017, according to Debtwire intelligence. The company's guidance for a breakeven EBITDA performance this year is predicated on the continuation of current market conditions, including spot prices, according to a company press release. Many investors, however, anticipate steel prices to continue trending lower, with predictions that US Steel's 2016 EBITDA could go negative. To moderate its debt situation (currently estimated at US$2.4bn), US Steel could begin selling excess iron ore pellets, among other options as it tries to manage upcoming liabilities and enhance value, company executives said at an event in March 2016. Debt and slow growth are weighing on AK Steel's performance, even as revenue shows year-on-year improvement, albeit modest at 3%. For 2015, the company recorded total debt of US$2.3bn and a leverage multiple of 5.9, matched with company reports of a net loss of US$509m in 2015. Under a new strategy, AK Steel aims to improve its financial and operational performance by targeting higher value steel products that command higher prices, reviewing assets and product offerings, and developing new products and processes to boost its competitiveness. It has also idled one of its three blast furnaces. AK Steel is also focused on squeezing the benefit of lower raw materials costs as it anticipates another challenging year, management said on an investor call in January 2016. At 30 September 2015, it had a liquidity cushion of US$821m, however, if EBITDA continues to decline this availability could decline sharply. Decreasing sales, record-low cash on hand, and a towering debt load are among the mounting challenges currently facing Allegheny Technologies (ATI). According to Debtwire analytics, the company's top line plunged 22% year-over-year to US$833m in 3Q15 from US$1.1bn in 3Q14. Exacerbating an already dire set of circumstances, due to a lack of progress in ongoing labor contract negotiations, ATI issued a lockout notice effective 15 August 2015 to about 2,200 employees at various facilities, negatively impacting revenue. A tentative agreement was only reached on 22 February 2016 and still needs to be ratified. In January 2016, management gave optimistic projections for the first half of 2016. It is forecasting second quarter 2016 EBITDA to more than double similar figures from the previous year (US$32.3m). The improvement is expected to be driven by several factors, including lower costs resulting from a workforce reduction and greater operational efficiency from capital expenditures. Management also recently announced plans to sell its money-losing EnergeX business, which manufactures products for oil and natural gas producers. The business dragged down earnings over 2015 and will allow resources to be redeployed into more profitable ventures. The North American assets of Indian steel producer Essar have both slipped into troubled financial situations. The company's Canadian unit, Essar Steel Algoma, is in the midst of a shaky debt restructuring and sales process as it courts a list of possible buyers. Suffering from a prolonged liquidity crisis throughout 2015, the steel producer sought protection from creditors in November 2015, its second restructuring since 2014. In the US, Essar Steel Minnesota has also started to falter: in March 2016 the company appointed financial and legal advisors to help with a proposed debt restructuring. With total debt of US$2.6bn with no maturities until 2019 and liquidity of US$1.7bn, Steel Dynamics remains on more solid ground relative to its industry peers. Yet, it is increasingly close to teetering into distressed territory. While revenues declined 13% year on year, they still surpassed those of competitors at US$7.5bn in 2015. Utilizing more cost-efficient arc furnaces compared to traditional blast furnaces, Steel Dynamics has used innovation and modernization to its advantage, and management believes that the company's low-cost business model will allow it to continue to generate strong cash flow going forward. Macro trends have led the metals distributor — which supplies products to the aerospace and defence, oil and gas, and shipbuilding sectors, among others — to post a 16.7% year-on-year drop in revenue to US$790m in 3Q15, according to SEC filings. As a result, market participants are viewing Ryerson's upcoming bond maturity as a potential trigger for a capital structure overhaul unless an unlikely recovery sweeps over the metals industry, according to Debtwire intelligence. In order to strengthen its liquidity, Ryerson plans to reduce annualized expenses, sell non-core assets through the first half of 2016, and pay down asset-based lending through cash generated from operations. Feature Q&A: US steel producers bend, but will they break? Can the recently imposed tariffs save the US steel industry? HP: While the significant new tariffs imposed on certain steel imports have certainly reduced imports and lifted US prices, new import sources will likely fill the gaps that have opened up, thus diluting the overall impact of the antidumping duties. To compete in the current environment, US steel producers must place continued focus on cost reduction through operational levers, raw materials supply renegotiation, and asset footprint optimization. Equally, support from the US government to help the ailing steel industry deal with its legacy costs would take a load off certain producers' shoulders. What are the biggest risks and concerns for the US steel industry? HP: Low global steel prices will likely pose the greatest challenge for US steelmakers in the year ahead, however, renewed import growth from countries that haven't been hit by high tariffs and an inability to reduce input costs could also have potentially high consequences for heavily indebted integrated producers. Granted, current liquidity levels have provided some breathing room, but rolling over unsecured debt when it matures may prove challenging. Several downstream industries or those in the sphere of US steel's influence could also feel the knock-on effect of rising stress levels in the steel sector. Really, any company whose business depends on a healthy local steel industry can be impacted by pricing pressure, volume loss from potential capacity shutdowns or supply contracts being ripped up in bankruptcy proceedings, if US steelmakers find themselves in court. Depending on how the year unfolds, what will the US steel industry look like in 2017? HP: In the absence of a sustained recovery in steel prices, integrated steel producers will remain under considerable pressure. Drains on liquidity could cause hopes of refinancing unsecured debt to evaporate, potentially forcing companies to consider chapter 11 protection. We could also see a medium to widespread consolidation within the industry as stronger steel companies acquire smaller producers. The arrival of foreign steel giants could see a potentially interesting value chain reconfiguration as high quality international slab imports replace the hot end of North American integrated players to serve the demanding auto sector at a lower cost. How can US steelmakers reduce and manage current debt levels? SG: Absent an unanticipated rebound in commodity prices, steelmakers may have to request restructured loan terms to reduce debt service, modify financial covenants and extend maturities. In some cases, additional equity contributions may be required. In the absence of the willingness of equity to share risk, resorting to a court process like chapter 11 may be required. Chapter 11 can be a useful tool to level the playing field and allow companies to negotiate with creditors relieved of the threat of imminent enforcement. In extreme cases, a nonconsensual restructuring of debt terms may be achieved, and even the possibility of such an outcome may incentivize lenders to negotiate. Chapter 11 can also be very useful in implementing, over the objection of hold-outs, out-of-court restructuring negotiations with significant (but not all) creditor constituencies. How does restructuring in the steel industry differ from other commodity industries? RC: Outside of coal, most of the other significant restructurings that we've seen in the mining and metals space have involved operating assets in emerging markets. For secured creditors, these have therefore required emphasis on matters like host government consents, local partner/joint venture partner consents and other hurdles to enforce security. There has also been difficulty in attracting financing, due to the limited subset of new money providers who will participate in emerging markets. The complexities of a North American coal or steel restructuring are more focused on finding solutions for dealing with legacy costs and environmental liabilities. Additionally, there's the challenge of finding funding to "bridge to closure" in that many producers have insufficient liquidity for one-off costs of closing and remediating loss-making operations in their portfolios. How can US steelmakers achieve their goals during asset sales and is there a market for divestitures? JT: Given the significant number of companies under distress and the almost consensus view that the oversupply of steel will continue for some time, it is going to be very difficult to achieve balance sheet restructuring through asset sales. In most instances, the list of logical buyers is quite small or even non-existent. Any acquisitions are likely to be closely scrutinized by global competition regulators and by the Committee on Foreign Investment in the United States. Financing will also be difficult to secure in the current market for all but the strongest balance sheets due to the ongoing weak pricing outlook on steel. As an alternative to the often short-term solution of cost cutting and downsizing, divestments of non-core assets have become common practice among global steelmakers looking to clean up their balance sheets and add firepower to their coffers. Case examples include Germanybased ThyssenKrupp and Russian Severstal, which both sold their US operations in an exit of the North American market in 2015. Similar actions among US steel producers have so far been less successful. In 2015, US Steel initiated the sale of its Canadian unit, a move that ultimately failed given deteriorating market conditions and ongoing clashes between the parent company and stakeholders. The collapsed sale of the business means that broader options may need to be explored in the future, including the possibility of liquidation of the asset, US Steel representatives said in January 2016. While an attractive option for individual steel producers, asset disposals may only offer temporary reprieve for the industry as a whole, deferring the permanent removal of capacity through reallocation amongst industry players. Likewise, the urgency created by a distressed situation can lead to the sale of non-core or underperforming assets at grossly undervalued price levels, which may not yield sellers a return adequate enough to avail debt burdens. A successful sale is dependent on appetite within the sector to absorb such assets. Given the compounding financial and operational pressures currently facing US steel producers, the list of possible buyers in the domestic market is a short one. For instance, Nucor Corporation is one of the few boasting promising performance and the ability to execute such transactions. Nucor has maintained a strong balance sheet that has generated profits across the business cycle. It is also the only US steel company to carry an investment grade credit rating and has displayed an appetite for M&A, announcing in November 2015 the acquisition of Gerdau Long Steel's Bright Bar assets. Foreign strategic steelmakers, on the other hand, may offer the best bets for US steelmakers looking to sell assets. Since 2012, sales of US steel assets to foreign buyers have trended up, reaching US$2.2bn in 2015, a year-on-year increase of 51%. In that time, significant deals have been struck by Japanese acquirers (Hitachi Metals and Nippon Steel & Sumitomo Metal Corp, to name a few) and international steel corporations the likes of ArcelorMittal. However, these foreign strategic players are under severe pressure themselves, which may limit their appetite for all but the most opportunistic M&A. The possibility of certain US steelmakers finding themselves in bankruptcy court in the years ahead is becoming a very real possibility. Questions surrounding this fate for US Steel have led to much speculation, however, US Steel CEO Mario Longhi, speaking at a conference in March 2016, firmly denied that the option to file for chapter 11 protection was even on the table. While admitting that the industry is in recession, Longhi maintained US Steel will remain focused on factors it can control, namely idling facilities, workforce rationalization, and delaying construction of an electric arc furnace. Currently, US Steel has the financial cushion to ride out the year, with its main liability a US$450m maturity in June 2017 and US$1.5bn in availability on a revolver and more than US$1bn in cash. Beyond that, US Steel's future remains uncertain. While the options currently being utilized may provide a brief respite, a deep-rooted transformation where outdated processes are replaced by innovative best practices could be the jolt the industry needs to not just survive the current pricing and competitive environment, but thrive in it. A possible starting point would be a re-evaluation of current strategies and technologies. In a market where steelmakers arguably need to get smaller to survive, traditional processes and businesses should be reconsidered in favor of more modern approaches. The development of innovative value-added steel products will be another necessity as the broader supply chain and other industries look for ways of optimizing their own businesses. For instance, automotive manufacturers seek materials that are lightweight yet robust to increase mileage and absorb energy on impact, while oil and gas majors require steel products that can withstand demanding extraction conditions. These needs and many others will require innovative new products to complement existing steel offerings. Additionally, incorporating a digital component into this transformation can add efficiencies at numerous operational levels, creating connectivity, synergies, and facilitating shared information among business units. In this way, waste can be eliminated and change engendered as modern advances, such as 3-D printing and digital simulations, add a previously untapped dimension to steel production. However, the industry requires sufficient cash for working capital and investment capex to facilitate "bridge to execution" of these innovations, and availability of this cash is far from guaranteed.